As Institute of Technology Carlow prepares to welcome the first intake of students on the country’s only honours degree course in brewing and distilling, the programme has received a huge endorsement by becoming one of only four in the world to achieve recognition by the prestigious Institute of Brewing and Distilling (IBD). 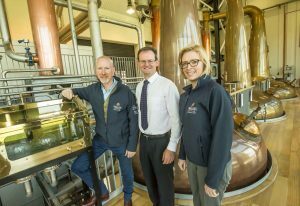 And Walsh Whiskey Distillery, which boasts one of Ireland’s largest distilleries and a visitor centre in Royal Oak Carlow, has announced it is to award a €1,000 bursary prize to the brewing & distilling student who achieves the highest grades at the end of his or her first year. The bursary, according to Bernard Walsh of Walsh Whiskey Distillery, recognises Institute of Technology Carlow as “a centre for teaching, learning, research and innovation in brewing and distilling”. The IBD is the world’s leading professional body for the brewing and distilling industry and promotes education and professional development in the science and technology of brewing, distilling, and related industries. It spent the best part of a year assessing the degree course at Institute of Technology Carlow before announcing its endorsement. The Carlow-based programme now becomes one of only four worldwide to have achieved this recognition by the IBD. Graduates of the degree will be eligible to sit the Masters level professional qualifications of the IBD. Bernard Walsh, Founder and Managing Director of Walsh whiskey said, “We are delighted to be a collaborative partner with the brewing and distilling degree course at Institute of Technology Carlow. The development is hugely welcomed by the industry which is crying out for qualified staff. To this end, the Institute is becoming a recognised centre for teaching, learning, research and innovation in brewing and distilling”. Dr. David Ryan, programme director for the new degree course at Institute of Technology Carlow welcomed the news of both the Walsh Whiskey Distillery bursary and the IBD recognition. He commented, “The new degree programme is an incredibly exciting and timely development for Ireland’s growing brewing and distilling sector. Our graduates will support the industry in the region, nationally and globally. The Walsh Whiskey Distillery bursary will inspire first year students to get off to the best start in their degree, while also making an impression with one of the leaders of Ireland’s whiskey renaissance”. Launched last October, the Bachelor of Science (honours) degree programme in Brewing & Distilling, followed two years of research and development by Institute of Technology Carlow that included consultation with industry, representative organisations, national bodies and government. The programme has received huge support from the industry who have consistently reported difficulties in recruiting suitable qualified staff. According to the Food Wise 2025 national plan, Ireland’s brewing and distilling industry will contribute towards the creation of an additional 23,000 food and drink based sectoral jobs by 2025, an 85% increase in food and drink exports to €19billion and a 65% increase in primary production value to €10billion. Whiskey exports are up 60% since 2009 with 60 million litres exported per annum. 28 distilleries are now operating or being developed on the island of Ireland and the number of microbreweries are expected to grow to 100 by 2025. Direct employment in distilling will grow 30% by 2025. A surge of interest in craft beer and micro distilleries, emerging markets in Asia and the explosion of the craft alcohol market in the United States are fuelling the sector.